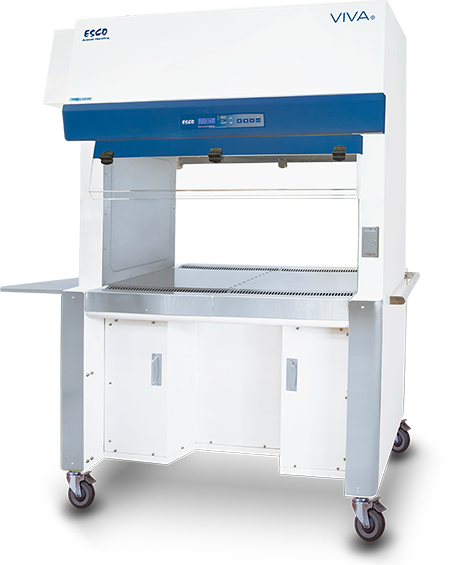 The Esco VIVA Dual Access Animal Containment Workstation is a modified laminar flow clean bench with unique air-balancing properties to provide personnel and product protection during animal handling procedures. Based on caster wheels, this highly maneuverable cabinet features the Sentinel™ microprocessor and 2 Minihelic® pressure gauges for easy air-flow monitoring and control. To ensure maximum efficiency and flexibility during operations, the Esco VIVA adopts an open access concept that is designed for cage changing operations. The large 14" work access opening enables ease of insertion and removal of cages from the work zone, while the electrically adjustable height and ergonomically sloped sash deliver maximum user comfort.